STEM + Art = STEAM = Fun! It's like a wild language arts class as ventriloquist Steve Petra brings kids up on stage for demonstrations and challenges. 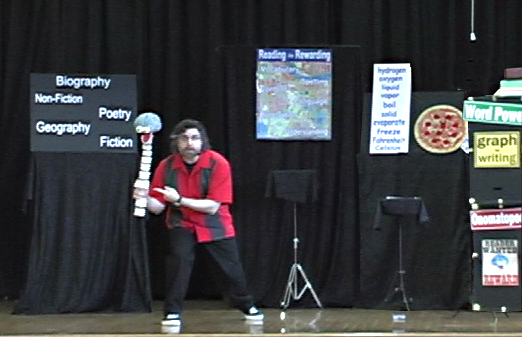 Students interact with a cast of bizarre characters including The Brain, Pierre Lobsterre, Demento and Gus The Word Bird. Reading Rampage was created for the older grades and covers grade appropriate concepts from the language arts curriculum. We also have a younger version of the show (available if booked the same day) with grade appropriate content. We strongly recommend that you book the older and the younger versions of the show and separate the grades. The show features audience participation, illusions, original songs and music. Life Skills. Perfect for STEAM. Ask for the Teacher's Guide. BOCES assisted. Tell us your PARP theme, we can probably accommodate you. Themes have included: Read Across America, Dr Seuss, Safari, Space, Super Heroes, Science, Detectives and Olympics. Note: Reading Rampage is a school day assembly program, it is not suitable for evening PARP.